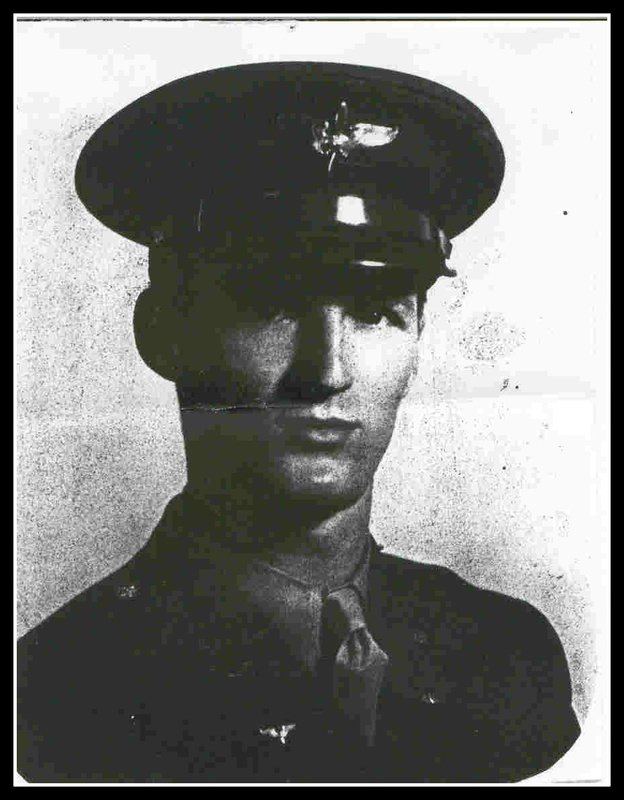 (Aug. 9, 1945) -- 2nd Lt. Victor Bruegman, 26, was killed over Hungary on July 2, 1944. Bruegman served in the 744th Bomber Squadron, 456th Bomber Group, Heavy which operated out of the Stornara Airfield located near Cerignola, Italy. The target that day was the Shell Oil refinery at Budapest. Thirty planes from the 456th Bomber Group left for the mission, and eight did not return. According to B-24 pilot Robert C. Alexander, his aircraft, #42-78072, was shot down over Budapest. Five of the men on board were killed, the rest - co-pilot, radio operator, navigator, nose gunner and engineer were - taken prisoner. Alexander was the only member of the crew uninjured. In a letter written to his dad on Oct. 9, 1944, Alexander "writing from Stalag Luft III ... I don't know if you knew but both "P.C." (Page Hendrickson, pilot) and "Brugie", (Victor Bruegman, bombardier) were killed. From all the information I have I seem to be the only one on my crew that got out with no injuries." Pilot: Page C. Hendrickson - Wheeling, W. Va.
Co Pilot: Robert C. Alexander - Warrendale, Pa.
Navigator: Edward B. Wagner - Portland Ore., or Woodland, Calif.
Bombardier: Victor Bruegman - Belleville, N.J.
Top Gunner: Glenn W. Constable - Johnstown, Pa.
Ball Gunner: John L. Weidrich - Buffalo, N.Y. Nose Gunner: J. T. Phillips - Belmont, N.C.
Tail Gunner: Robert P. Mack - Milwaukee, Wis.
Radio Operator: Earl E. Richardson - Christiansburg, Va.
Just lately I've been getting my mail. On the 31st I received 8. (4 from you and one each from Rose Marie, Eula & Cliff, Frank Beveridge, and Mrs. Betty Bruegman.) Betty had a baby (a boy) on Sept. 22. Did she get my address from you. I don't think she knows yet that "Vic" is dead...."
Bruegman enlisted in the Army on April 2, 1941. He served 1-1/2 years in the infantry before transferring to the Air Corps in 1943. He received his wings at Big Spring Bombardier School in Texas on Dec. 25, 1943. He went overseas in May and landed in Italy on June 6, 1944. Second Lt. Victor R. Bruegman, U.S. Army Air Forces, serial number O-703441, of the 744th Bomber Squadron, 456th Bomber Group, Heavy, entered the service from New Jersey. Bruegman, a 1937 graduate of Belleville High School is the son of Mr. and Mrs. Alvin Bruegman of Malone Avenue. His brother Richard is serving in the South Pacific. His family was notified that he was missing in action on July 27, 1944. He is survived by his wife Betty, and has a son, Victor Jr. whom he never saw. Victor's brother married Helen Papartis whose sister Alice wed Clatie Cunningham. 2nd Lt. Victor Bruegman, who received the Air Medal and the Purple Heart, is buried at Plot K, Row 9,Grave 14, in the Lorraine American Cemetery, St. Avold, Moselle, France. 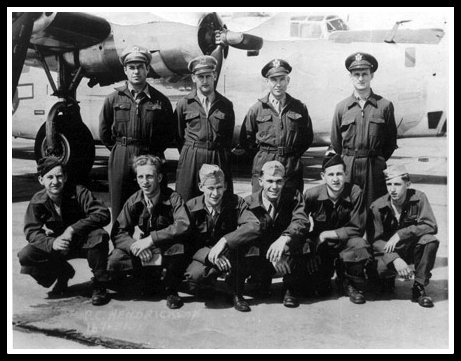 Top row, from left: Page C. Hendrickson, Pilot; Robert C. Alexander, Co-Pilot; Edward B. Wagner, Navigator; Victor R. Bruegman, Bombardier. Bottom row, from left: Glenn W. Constable, Top Gunner; Arthur A. Pope, Engineer; John L. Weidrich, Ball Gunner; J.T. Phillips, Nose Gunner; Robert P. Mack, Tail Gunner; Earl E. Richardson, Radio Operator. AAF 201 - (6445) Alexander, Robert C.
Reference is made to your kind letter of January 24th relating to your son, Lieutenant Robert Alexander and the crew members who served with him on his last mission. Your letter is being referred to the Adjutant General, Casualty Branch, who would be concerned with such information regarding missing personnel as Lieutenant Alexander gave in writing you. The discretion you show in refraining from writing the families of Lieutenants Bruegman and Hendrickson is to be commended. Much unhappiness may result from a confusion of reports, and it is best to give the War Department an opportunity to establish facts and notify the emergency addresses wherever a change of status occurs. UPDATE: Vic Bruegman Jr. was working on his Master's at Louisiana State University when while horse-back riding he was thrown and died on Nov. 27, 1971.